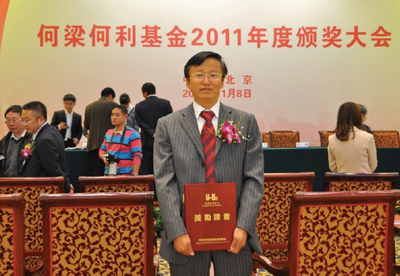 Prof. GAO Lizhi was awarded the "2011 Prize for Scientific and Technological Innovation of Ho Leung Ho Lee Foundation"
The awarding ceremony of the 2011 Ho Leung Ho Lee Foundation was held in Diaoyutai State Guesthouse, Beijing on Nov. 8th, 2011. LIU Yandong, the State Councilor, sent her congratulatory letter. ZHU Lilan, Director of the Selecting Committee of Ho Leung Ho Lee Foudation and Former Minister of Ministry of Science and Technology, made a report on work to the Meeting. SANG Guowei, Deputy Chairman of the Standing Committee of the National People's Congress, WAN Gang, the Vice-chairman of CPPCC and Minister of Ministry of Science and Technology, and ZHAN Wenlong, Deputy Director of CAS and others concerned were present at the ceremony and took up the prize presentation. Ho Leung Ho Lee Foudation was established in 1994 by Hong Kong patriotic personage HE Shanheng, Doctor LIANG Qiuju, Doctor HE Tian and Doctor LI Guowei. The foundation is a non-profit award fund for science and technology set to reward excellent Chinese scholars in science and technology fields for their outstanding achievement, significant progress and innovation. It has obtained high praise and social approval from domestic and overseas science and technology field with its normative operation, rigid standard as well as the credible and authoritative elected records. Since the establishment in March, 1994, Ho Leung Ho Lee Foudation had 18 periods of selected and awarding activities with 952 excellent scientists being honored. Fifty-five persons are awarded for the Ho Leung Ho Lee Foudation 2011, including one as "Science and Technology Achievement Award", 35 persons as "Science and Technology Progress Award" and 15 persons as "Scientific and Technological Innovation Award". With the approval of selecting committee plenary session of Ho Leung Ho Lee Foudation on Sep. 8th-9th, 2011, Doctor GAO Lizhi, researcher of KIB and deputy director of Germplasm Bank of Wild Species in Southwest China, National Cosmology Workshop was awarded with the "Prize for Scientific and Technological Innovation of Ho Leung Ho Lee Foundation" to commend his outstanding achievement in Chinese scientific and technological progress and innovation.